What is the ‘Stay Put’ Policy? 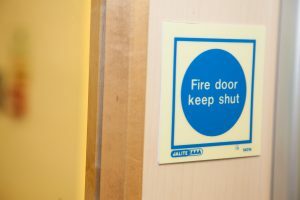 It is vital to your workplace's safety that your fire doors are maintained. Read more about our free site survey. Fire safety in all buildings – residential and commercial – is of great importance, and with the ‘Stay Put’ method being applied to blocks of purpose-built, residential dwellings, there is a lot of media attention on this evacuation procedure. This month, at Elite Fire, we’ll be providing some details on exactly what this method is, why it’s used, whether people would use it and how you can be responsible when it comes to knowing your fire safety options in any building you enter. The essence of the ‘Stay Put’ policy is that, in buildings purpose built flats and apartments, residents not in an area directly impacted by the fire should stay inside their flat with doors and windows shut. When a fire occurs within your flat, or in common parts of the building, you are advised to leave the premises and call the fire and rescue services. Those who are not directly affected by the fire should remain in their flat until told otherwise by fire and rescue. However, those who wish to leave are not legally beholden to stay put – nor is it said that people evacuating a flat which is on fire can’t alert others. According to the local government’s ‘Fire safety in purpose-built blocks of flats’ guide, some fire risk assessors have taken the approach to consider a building inadequate for the ‘Stay Put’ method unless it can be proven that the construction standard is up to scratch. Simultaneous evacuation is the alternative which evacuates residents all at the same time, but this requires a detection and alert system to inform everyone in the building. There are several reasons why the ‘Stay Put’ method has been backed for many buildings as an evacuation process. The first reason is that, where concrete and fire doors are used to construct the homes, it creates a protective barrier against fire, containing it and giving fire and rescue services time to battle the blaze. Concrete might be unsightly to look at, but fire-resistant properties mean a slow transfer of heat and structural integrity for longer periods. Secondly, in order for firefighters to do their job safely and quickly, clear corridors and stairwells help massively. If people can be kept safe from fire by the compartmentation of their dwellings, fire and rescue can focus efforts on extinguishing a fire without a need for mass panic inside a building. Would people choose to use the policy? Last year, as part of the Fire Door Safety Week, research was released which showed a lack of confidence in the ‘Stay Put’ method. 72% of respondents said they would not stay in their flat if a fire broke out in their building (even if their own flat was unaffected by the smoke or fire directly). On top this, 39% said they didn’t have faith in the construction of their building to protect them from smoke and fire. There were also issues around tenants not knowing who the responsible person is for their building (only 38% knew it was the landlord). It is vital that no matter what building you are in – even as a visitor – that you know what the appropriate fire evacuation and safety policies are. From the ‘Stay Put’ method to using wet towels to seal doors from smoke, you should always be prepared. Taking a little bit of time to familiarise yourself with the fire safety policy of a building could help save lives. If you’re a landlord or you operate a commercial space and you aren’t sure of your duties towards fire safety as the responsible person, or you don’t know if your building uses the ‘Stay Put’ method, get in touch with our professional team today for training, risk assessments and more.